Our courses are approved with the Oklahoma Construction Industries Board to satisfy your continuing education requirements. Take the continuing education to renew your OK plumbers license today. All of our courses can be completed At Your Pace Online to help you meet the state's requirements to maintain your license. Once you finish your class you will have an official certificate of completion to save for your records, and we will report your course completion to the state for you. Most Oklahoma Plumbers are required to obtain 6 Hours of Continuing Education. CE must be completed every 3 years in order to renew their license. This 6 hour class will meet your 6 hour CE requirement to renew your license. It contains the minimum of 2 hours on Code and 4 hours on Code or Industry related topics. Your request for Six (6) hours of continuing education credit covering 2015 Oklahoma Plumbing Code has been reviewed and approved. 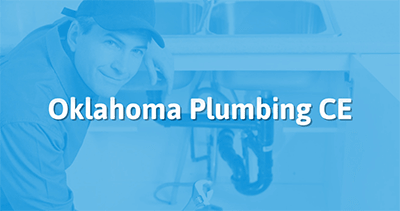 This course will meet the Oklahoma requirements of continuing education over the code for each Plumbing contractor or Plumbing journeyman attending this seminar. The enclosed sign-in sheets must be returned to this office for verification of attendance for individual credit for each individual desiring continuing education credit for this training. Please confirm that each licensee signing in uses his or her proper name to ensure each licensee receives credit. You MUST use the Course Identification Number located in this letter on all correspondence and certificates of attendance pertaining to this seminar. If you have any questions or need further assistance please call this office at (405) 521-6550. Each future course will be assigned an individual identification number for tracking.